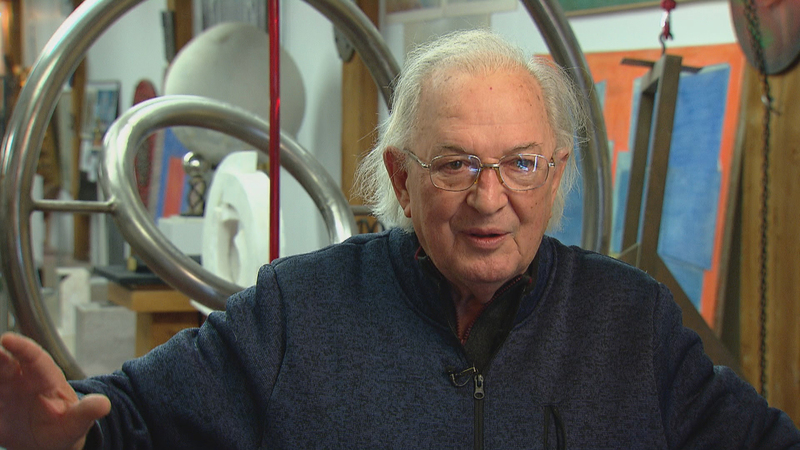 Born in Italy, Virginio Ferrari came to Chicago in the 1960s, and he blossomed into an internationally sought-after sculptor. The artist recently turned 80 years old. “Chicago Tonight” visited him in his Bridgeport studio on the eve of what promises to be another big year for him. Phil Ponce: You’ve seen his abstract work “Being Born” at the Ohio Street feeder ramp. Or “Dialogo” beside the International Studies building on the University of Chicago campus. Or “Super Strength,” set into the wall of an engineering building at the University of Illinois at Chicago. Perhaps you’ve even seen his work on the campus of a suburban retirement home. But the maker of the sculptures is nowhere near retiring. We met Virginio Ferrari at the Bridgeport Art Center, where he maintains a studio filled with shape, color and texture. The many sculptures, models and works-in-progress can suggest order and harmony, or conflict and chaos. It’s a laboratory of ideas for a man from a family with a history of making things. Virginio Ferrari: My father and my grandfather, they were stone carvers. I was born in Verona, Italy, 1937, just before the war. During that period it was bad for everyone. We can see the plane coming, first you see one, and he will make some tour, and then after you see 20 of those and then … we can see the bombs falling down. It was terrible. Ponce: He is a modern artist, but Ferrari studied old-world traditions. And he has worked with marble from the same quarry that Michelangelo used. Ferrari: My training was very classical. My father sent me to a shop where they were doing figurative, more like religious work for the cemetery and so I was doing little angels or the face of Christ or the Madonna. Ponce: A chance meeting in Italy with a University of Chicago trustee led to an invitation. We came and honeymoon in Chicago. Instead of Venice like everybody – in Italy they go to Venice or other beautiful city, we came to Chicago and that was our first experience in this city. Ponce: His art was well-received, and he joined the faculty at the University of Chicago. Ferrari: I became very interested in the negative and positive space, most of my work is, you have the male and female, the negative and the positive. They kind of have a dialog together, they’re male and female and they almost touch each other and they talk to each other. Ponce: Ferrari and his wife raised a family in Chicago. Now, one of their sons – a filmmaker and professor in Rome – has edited a monograph that spans his father’s 60-year career. Marco Ferrari: Our home was much like this, everything had meaning and there was something always significant about placing something somewhere; or nature, bringing the importance of nature into the home. Ponce: The family has ambitious plans to cement the Ferrari legacy. Marco Ferrari: The idea is to create this foundation and create a space on the South Side of Chicago where, near where I grew up and have a space where my father’s work would be prominent but where it would inspire a community to work in sculpture or in film and trying to connect that with this studio space in Tuscany, Italy. Ponce: They are also re-proposing Ferrari’s most challenging project – constructing a mile-long sculpture parallel to Navy Pier. It has been on the drawing board since the 1980s. Ferrari: I think Chicago, it became one of the most important cities for the art, for the sculpture. It’s like a gallery, an open gallery, and that was always my dream, to do work where people can touch it, they can see it, they participate, you know? Ponce: Ferrari sculptures can be found in Europe, South America and Asia. He’s well-represented in his hometown in Verona, Italy – and his adopted hometown, Chicago. Ferrari: What I have done so far, I have to thank Chicago because I found the freedom to express myself. Note: This story first aired on “Chicago Tonight” on Jan. 9. Dec. 4: A new mural at the Chicago Cultural Center honors 20 women, past and present, who contributed to the cultural life of the city. “Chicago Tonight” was on site throughout the creation of the work, the largest to date by Chicago artist Kerry James Marshall. Ask Geoffrey: What Are Those Faces on Michigan Avenue? Oct. 25: Geoffrey Baer gets eye-to-eye with some sky-high building ornament and gets beneath the surface of a towering metal figure in this week’s edition of Ask Geoffrey. Aug. 8: "We dedicate this celebrated work this morning with the belief that what is strange to us today will be familiar tomorrow,” former Mayor Richard J. Daley said at the statue’s unveiling in 1967.